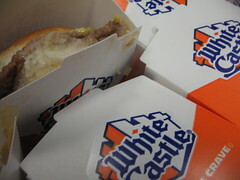 So it turns out White Castle burgers are pretty small, with beef patties about the size and thickness of slices of spam, so it’s customary to order several for one meal. Amy and I got a meal of ten cheeseburgers for both of us, though it turns out that two or three burgers each is probably enough when eaten with fries and sodas. Delicious, though, and one could feel the historic and gastronomic weight of this fine establishment in every bite. Where I come from, we call them sliders. It is common in high school for someone to try and see how many they can eat at one sitting. 35 to 40 is a pretty common figure for this activity. But it’s the holes that make them unique.